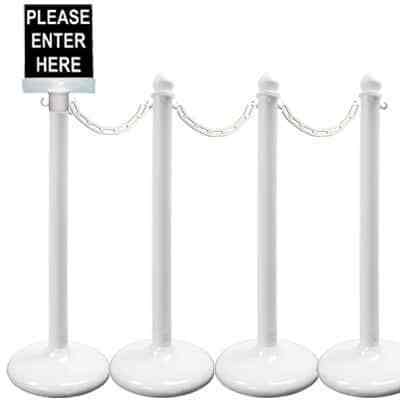 Crowd control stanchions are perfect for both outdoor and indoor use. Simple in design, they are lightweight and easy to move. These stanchions are ideal for guiding your guests to where they need to go. Have an event where you need to ID people or charge and entrance fee? Need to form an instant line? No problem. These stanchions tell people where to go. They create instant lines and order at your event. Great to use for concessions lines, bar lines, bathroom lines and carnival lines. You can set them up to block people out of private areas or to create boundaries. Non-verbally, they communicate where guests are allowed to go and where they are not permitted. Essential for any large volume event, boozy celebration or block party. Want fancy stanchions? We have those too. Check out all of our Red Carpet Event Rentals by clicking here.